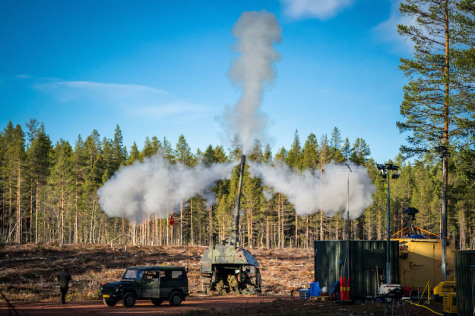 As of today, the Royal Netherlands Army again has an independent artillery department. This afternoon, the 41 Artillery Department was formally stood up at the Army barracks at Oldebroek. The arrival of the new unit symbolizes the beginning of the restoration of the fire support function within the army. Through its establishment, there is again a specific unit for the operational deployment of fire-support with both self-propelled howitzers and 120mm mortars. An evaluation of the Fire Support Command (VustCo) showed that there is a need for such a new unit. At VustCo, it was part-time work until today. The creation of the new unit was an essential condition for taking the next step: expanding the Army’s ground-based fire support (artillery). A change of command accompanied the official re-establishment. Lieutenant Colonel Rob ten Horn has replaced Rienk Sijbrandi, who was in charge of the artillery. "My priorities for the coming period are cooperation, collaboration, growth and strengthening operational readiness," ten Horn said. Lieutenant Colonel ten Horn subsequently also became Corps Commander of the Korps Rijdende Artillerie, or Royal Artillery Corps.